At the height of the social crisis within Rome, she dispatched three citizens according to Livy to Athens in order to find out what the appropriate constitutional forms might be. The report from Athens was eagerly awaited and led to major reforms in the Roman constitution. (3.33) Livy points out that such reforms were not actually that successful - he argues that the constitution created was 'all wood and no fruit' (3.33) but of course no reader could not fail to appreciate that the new formation produced the Twelve Tables of Roman Law- the basis for Roman law down to Livy's day and something that we shall move to discuss later. But let us focus for a moment on the central point Livy makes here- that Roman constitutional innovation proceeded from seeking the advice of another city. There are a couple of interesting issues here- why Athens in particular was mentioned and why Rome's story includes discussions of other cities necessarily. Firstly why Athens? I do not think that Livy could prove that the senators did go to Athens- indeed there is an implausibility to it as Rome was far closer to the Greek cities of southern Italy. Rather the reason that Athens is mentioned here I think is the prestige that the name involves. Athens was the most famous example of democracy in the ancient world- Sparta its opponent the most famous example of what Plato called timarchy. That Livy identified Rome with Athens is not surprising to any reader of Fergus Millar's lectures on the Republic: Rome had democratic features. The office of the tribunate and the powers of the popular assembly can be underrated in Roman history, and when we see the class conflict in Livy we see two classes who can both fight against each other. Athens looks a logical place to go for lessons for stability therefore for the ancient Romans- and an obvious place for them to have absorbed lessons about constitutional conflict- particularly the Athens of Solon and not the Athens of the fifth century itself. The Ancient world prided itself on its law makers- Solon, Brutus, Lycurgus- who provided models to their cities of how they ought to politically proceed. These statesmen moulded their cities in their images- and created civic structures to perpetuate their genius- to turn personal virtu into political virtu. In many senses these figures stood between the age of heroes and the age of constitutions- they straddled the world of personal heroism, the Odyssey and Illiad, and the world of constitutions. The problem that Rome had at this point in her history was renewing her own constitutional framework- how natural to look to the laws devised by one of these great lawgivers in pursuit of reform. What is interesting though is that for Livy these people remain Romans- they remain Brutan in their constitutional thinking and the Solonic innovations do not work. Curiously therefore the Athenian influence that Livy maps is one of failure- the Athenian implant did not succeed in changing the Roman state into Athens- what it does is extend the Brutan nature of the people by providing a graft extending a principle embodied already. The end of the decemvirs is the 12 tables- something that fits into Roman nature- the end of the decemvirs though is swift as the structure did not fit. One might ask why Livy feels necessary to include this episode- what does he think it tells us about Rome. I'd say that Livy acknowledges here a part of the Roman story that cannot not be acknowledged- that Rome was influenced and changed from the first moment of her history by the interference of foreigners. At points like the Claudii from the Sabines they were other Italians- but often it was not other Italians, but the more important example of Greece that changed Rome. The fact that in Greek political life- whether Athens, Corinth, Sparta, Corcyra, Argos, Thebes, Chalcis, Mytilene or all the other cities, famous in story and in song- the formations of life and politics possible in a polis had been tried and a long history of political thought had been developed in order to understand those regimes in antiquity before Livy. It is more likely that Rome's first contact with this was through the cities of southern Italy that the Greeks had founded- possibly even that was where Romans sought some constitutional inspiration- they didn't have to go to Greece. But Livy had to in order to invoke the genius of the Athenians and Solon. What Livy tells is a complicated story about the development of Rome- I have mentioned that Livy definitely believes in the mystical idea of Rome surviving down the centuries- he sees a continuity between Romulus and Augustus. But he is too good a historian not to understand that other places influenced Rome- for Livy, stressing the greatness of Rome, those other places have to be equally great and the point he wants to stress is that their influence did not change the course of Roman history. Influence pushed Rome in directions which were Roman but could not change the history of the Republic from becoming a regime led by consuls into victory on foreign fields. Athenian influence led to the decemvirs in Livy's view- the only constitutional experiment that did not last- its historically plausible that actually more of the original Roman regime was influenced by foreign example- but Livy wants to stress this marginal influence because he wants to stress the continuity of Roman history. In the years immediately prior to Cincinnatus's dictatorship, Rome was wracked with civil strife between the tribunes and the consuls. At one point the capital itself was seized by mutinying slaves- Livy has a wonderful description of the chaos of that night. Furthermore the tribunes told the Commons not to serve with the army whilst the consuls attempted to conscript them. Only when the forces of Tusculum marched on Rome, aided by the consul, were the slaves evicted and the capital retaken. The incident was merely the culmination of a period of social disunity leading on from the arrest of Caeso, Cincinnatus's son, and his flight. This was a key episode in Livy's history- because it brings out the arguments that Plebeians and Patricians made about the state, arguments that in my view were structurally forced on them and arguments which to a large extent explain the nature of Livy's Republicanism. The point here is to remember the original political dynamic of Roman life. The Roman soldier was invincible because of his commander but his commander was impotent without the soldier behind him. For the senate, the threat was always the ultimate one of leading armies to glory elsewhere- Coriolanus comes to mind- for the people it was always the threat to withdraw their labour as soldiers. So the constant themes of exile for aristocrats and resistance to conscription from the people are not accidental, but come back to the structure of Roman military life and ultimately to the Roman state's raison d'etre, its fighting forces. This point leads onto another- it leads to the crises of Roman life often being crises about the recruitment of armies just before a military expedition. At this point, especially after a period of social strife, the people were temporarily in a position of power visa vis their richer neighbours but they were also in a position of great danger- with all the disadvantages of war to be concerned about. We can see how this affected the arguments of both sides, as presented by Livy, when we look at the years leading up to Cincinnatus's consulship and his speech on assuming that office. When the capital was seized by the slaves, the tribunes, according to Livy, 'were so blinded with passion that they insisted the seizure of the Capital was a mere piece of play acting got up to divert the attention of the commons' from political questions. (III 16). The tribune's argument had to be that Rome was not threatened- as soon as Rome became threatened, the people united behind the senate and were subject to military discipline. The tribunes suspected that the entire device of emergency was a mere device- it was a trick, a ploy to hold off political argument for a while. On the other side, the patricians saw this as a rebellion against the whole idea of Rome. 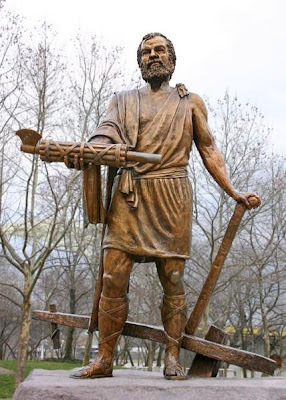 Cincinnatus in his speech reflects on the tribune's claims and dismisses them in the name of Roman unity. He declaimed to the people 'I ask the tribunes- is this what you call helping the people- to deliver them, helpless and unarmed, into the enemy's hands to have their throats cut?' and accuses them of attempting to create a 'state within a state'. The suggestion is important- what Cincinnatus is doing here is finessing the quarrel- in that the tribunes believed the state was being run in the private interests of the few- but doing so in a way that identifies his own party with that of Rome, in a sense that the tribunes who refused to fight for Rome could not. Ideologically the tribunes are calling for the poor to assert their rights, Cincinnatus is arguing for the poor to recognise that Rome's right is higher than theirs. This call disarms the tribunes effectively because it takes away the weapon of refusing conscription. But it is incredibly powerful- particularly for Livy. Livy calls Cincinnatus a great man later, but he also at the time calls the tribunes insurrectionaries (III 18). He is a historian after all of Rome- and ultimately the argument for the entity of Rome is made by Cincinnatus and not the tribunes- the argument of the senate carries more conviction with a historian or a poet (think of Virgil) whose unit of analysis is the mystical entity of a nation state. Analysed from the perspective of a plebeian who wanted land- the original dispute here was about land- the virtue of the mystical entity as opposed to a crust of bread may not be so obvious- but for Livy the populace lack the attachment to Rome that, as we have seen, in his eyes is a mark of civility. Political community or polis is separated from the Aequi and Volsci by the love of its citizens for their community: Patriotism in this sense is not merely a virtue but a marker of civility. As the patrician argument against the plebeians is a patriotic one and Livy's history is by its nature patriotic too, it is no surprise to find him admiring the virtues of a patrician partisan like Cincinnatus and despising the rebellious tribunes. The image here is important- and echoes that of Thucydides about the Athenian plague- but it merely is part of the situation rather than part of Livy's argument. The plague is part of what Livy describes as a situation announced by portents (III 5), in which all Rome had to depend on was 'her tutelary Gods' and 'her fortune' (III 6). As Livy noted it seemed the Gods recognised their prayers (III 7) and the raiding forces withdrew. Livy's moral Romans triumphed in that sense- in their moment of weakness the enemy spontaneously withdrew and their allies came into fight for Rome. Rome was saved therefore possibly by its virtue. But it was also saved by the vice of its enemies. Livy wants us to see that if the Romans were steadfast and virtuous, then their enemies were not. The Aequi were mere theives and not soldiers (III 6). However Livy implies a sociological point as well as a moral one- we have seen the Romans taking pride in their city and defending it. Let us look for a moment at the Aequi, people of the hills without a city, and the way that Livy describes their progress on Rome. The Aequi and Volsci lacked the strategical longterm sense of the Romans- they lacked the ability to stand steadfast to their objective but rather strived after short term objectives. Whereas the Romans were soldiers, the Aequi and Volsci were 'theives'. (III 6) I think what Livy gets here particularly, as ever, is the effect of the sights as they approach Rome on the Aequi and Volsci. Whereas the sights in Rome stirred men and women to devotion and to hopeless fidelity to their cause; the Aequi see the hills of Rome and are terrified by their history, they see the carcasses and think to move to Tusculum. It is an indication of the moral and strategical difference in Livy's view between the folk of the hills and city dwellers, the former are feckless, wild, animalistic and undisciplined, the latter are determined, devout and desperate to defend their homes. It is a distinction that we shall come back to, but it is crucial to understand, if we are to understand why Livy believed that Rome survived and eventually conquered these hill folk. Livy's case is partly that Rome was morally superior and partly that its population were strategically sounder- more determined- the two things run together and for Livy cannot be separated. Both meant that Rome survived the attack of the Aequi- she was saved by her character, as much as their folly in not conquering her was a result of their character. To use a Machiavellian word, and its no surprise that Machiavelli read Livy attentively, the virtu of the people, dependent on the way that they lived, deterimined their future. Lord Bragg is an arts journalist and a novel writer of some distinction. He presents what I think is the best program on any Radio or Television station in the world- In our Time where three academics gather with him to discuss a historical, scientific or cultural issue- from the library of Nineveh to Poincare's conjecture. The next series of In Our Time has just started- and I would reccomend it to anyone interested in the issues that this blog raises. Bragg has just done an interview with Mark Lawson- I think it is really interesting. Partly because Bragg describes his feelings about his father's return from the second world war- he describes a world essentially where he had his mother to himself and his father's return disturbed his world. Then he moves on to discussing equally interesting his own struggle with depression and his work with TV and radio- it is really interesting as a vision of late century Britain, from an intelligent person who cares a lot about his world and also about the future- he spends a lot of time saying that his world is not more exciting than the world that twenty year olds like me do, but different. That is a key insight into the way the past is- often not better or worse but different. Appius Claudius (I) died "a great man" and thousands attended his funeral. (Livy 2.62) However as Livy makes clear this great man was unable to either solve the social crisis or lead Rome's armies into battle against the Volscians coming down from the hills. Appius's failure should interest us because he represents an archetype, that Livy feels, was unable to cope with Republican politics. Appius was brave and principled- several times Livy shows him standing up to the plebeians, rebuking them to their face and even attempting to arrest their spokesmen: at one point his colleague (Titus Quinctius) in the consulship had to rescue him from the crowd in the forum and the senate convened to calm their colleague down and make sure that he did not risk death through his impetuous hatred of the commons (2.57). As this suggests, Livy's view of Appius is not entirely without nuance- a great man may not be a successful man. Perhaps this is demonstrated most by Livy's account of Appius's military career. Livy tells us that with appealing symmetry the two consuls were given command of two campaigns- Appius against the Volscians and Titus against the Aequeians. Livy then provides us with parallel and contrasting accounts of their campaign's successes. Appius took his 'savage' temperament to the battlefield- the response of his men was that they grew 'drunk on insubordination' and 'actively desired defeat'. (2.58) After they had been defeated, Livy provides an example of Appius's cruelty- he marched them back into Roman territory and had every man who had betrayed his post, whose unit had fled, who had lost his equipment or his standard, flogged and then beheaded. The rest were decimated (i.e. one in every ten, chosen by lot, was executed). As a contrast Livy develops an account of Quinctius's campaign where 'the consul and his men vied with one another in goodwill on one side and generous consideration on the other' (2.60). On their return to Rome, Quinctius's men summed up the distinction by telling their friends that the senate had given one army a tyrant and the other a father (2.60). Livy here is directing us to the conclusions that we ought to draw about politics from this episode. Appius's greatness is the root cause of his inability to command, his principles lead him to be unable to compromise with the outside world. As David Runciman at Cambridge might put it: Appius is the most dangerous kind of hypocrite. The man who believes in his own belief so much that he does not recognise that it is his own belief, rather than a societal good. Appius definitely saw no need to recognise the political game of persuasion- his political career was about confrontation and a refusal to care for the beliefs of others. At some points this leads to amazing courage, during his trial and just before his death, Appius stood as a martyr to the cause of senatorial glory. That steadfastness terrified his foes- and they refused to continue the trial, adjourning it indefinitely (2.62). It is what we might call greatness- but it is married to an inability to see other people's point of view when it is right and good to do so. Basically Appius was not a politician- he was a martyr and the garb of a martyr suited him, but in Rome he almost caused a riot and in the field, his inflexible hatred of his own men and their desires caused mutiny, defeat and savagery. Livy's point is an interesting one- it anchors him as a historian, a student of the changing human nature that can never be fully accommodated in a political system and determines the course of events as much as the general political and ideological framework does. But Livy also here offers us counsel about what kinds of personality thrive in which situations. Appius was a hypocrite of a particular sort- if he was not a fool. The hypocrisy of Appius was the hypocrisy of the martyr, of the great man, but what that great man or martyr was incapable of doing was controlling armies and being a Republican politician, he was capable of impressing even his opponents with his bravery. The example of Appius is interesting- the chances are that Livy's portrait is not historical but derives from scandalous rumour created centuries afterwards about the Claudian family, but what Livy here is doing is deriving out of his created history, principles to understand political nature. Here he does so by observing the way that situation and character can come together- at points a disposition can be useful, at points it cannot. The personality, Livy reminds us, is political- and in order to evaluate politicians, it is necessary to evaluate their strengths of personality. Appius was able to stand steadfast to his principles in moments of great danger- but unable to understand that compromise, that negotiation are needed when commanding an army or speaking in the forum.